“Not Really Gone” by Blaire Sharpe tells the powerful story about her life, and growing up under the loving grasp of the “rock” in her family, her grandmother. The inspirational story about her relationship with her grandmother is captivating and shows the reader exactly what it means to be loved, and cherished. Blaire’s parents were incapable of taking care of themselves, let alone raise her and her siblings, and the children were to be placed in foster care when their grandmother, Eleanor, intervened and took them to raise as her own. Eleanor was representative of patience, wisdom and strength as she endured through the struggles against her family’s legacy of alcoholism and depression. Though Blaire’s life was significantly improved in her grandmother’s care, she herself battled with addictions, but found recovery as she matured into adulthood. Later, with a family of her own, Blaire finds the tables are turned and lovingly takes care of her grandmother when Eleanor’s health declines. This is a beautiful story, completely captivating, and authentic. I love the author’s natural story-telling ability as she tackles numerous life issues relevant to everyone. I felt the love between Blaire and her grandmother jump off the pages; this is such a heart-felt read. More than love is the tenderness and respect the women held dearly for each other. Often, while reading this story I found myself reminiscent of the wonderful times spent with my own grandmother, and spent an enjoyable amount of time on “memory lane” and though I’m sure that was not the author’s intent, I was grateful for the bittersweet distractions. 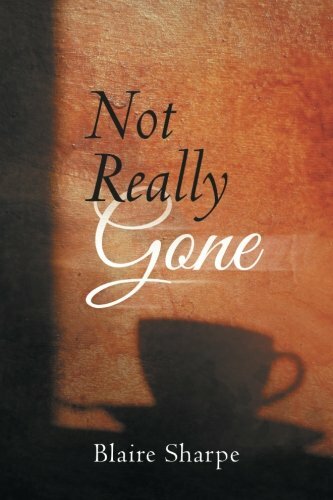 “Not Really Gone” by Blaire Sharpe is a commanding memoir, sure to engage the reader in deep reflection long after the book is put down. I find it unbelievable that this is her first book as she really is a gifted writer. I highly recommend this book to all families and caregivers. It is a wonderful book full of life lessons relevant to every single one of us. Well done.